Offering the latest information on the state of the humanities in schools, colleges, the workforce, scholarly research, and American life. A collaborative effort to collect and analyze information from humanities departments across several academic disciplines. The next iteration will appear early 2014. Complete this form to receive email notification when new and updated indicators are posted and for special announcements of interest to the humanities community. Please contact us if you no longer wish to receive this service. A snapshot of where the humanities are today—their value to American society, their continuing vitality and the many challenges they currently face. 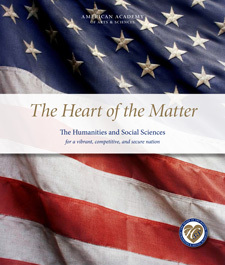 A new report of the Commission on the Humanities & Social Sciences warns against declining emphasis on humanities and social sciences in the United States.